Futura, whose real name is Leonard Hilton McGurr, is a veteran of the street art scene. The now 62-year-old began to spray illegally on New York's streets as well as in the subways in the 1970s. He became famous in 1981 when he went on tour with the British punk band "The Clash" and sprayed graffiti live on stage. He is regarded as a pioneer in the field of abstract street art, has significantly shaped abstract art and has become a role model for many artists. Today, street art is just one aspect of his work; presently, Futura exhibits in large galleries and is also a successful graphic designer. Pictured is his mural entitled 'Concrete Jungle', which was created in 2015 at the prominent Houston & Bowery Wall. The wall was made infamous in the late seventies by a painting of the celebrated artist Keith Haring. In 2008, the late owner of Bowery Wall, real estate developer Tony Goldman, initiated a new project in which contemporary artists from all over the world would seasonally bring new works to the wall. The focus is on artists who, like Futura, come from the field of street art. 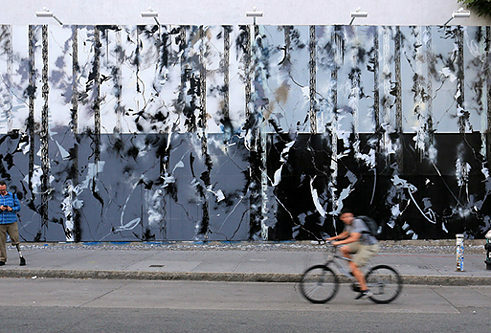 Featuring 'Concrete Jungle' at Houston & Bowery Wall from September 2015 to July 2016, Futura presents abstract shapes in all shades of black, gray and white. The title of the Murals takes the work out of abstraction and provides the gray city with its own little jungle, precisely one made of concrete. As worn as this metaphor may be - on the Bowery Wall the gray fauna looks like a long-neglected but still present threat from Mother Nature.